I would like to introduce my first pattern that will be available for sale (via pdf through Etsy) soon under my very own label is the Lilly Dress. Drafting patterns is something that I have become quite comfortable with the last few years. Developing an idea and figuring out how to transfer your flat sketch into a wearable to 3D object is a challenge I really enjoy. 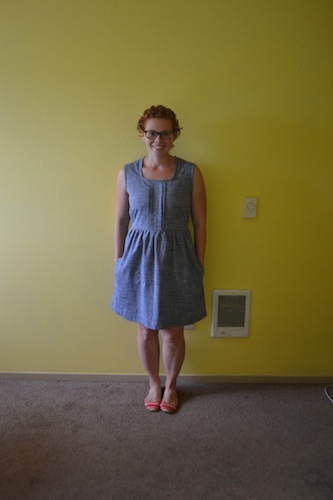 The Lilly Dress is a pattern that I created in an effort to fill my wardrobe with items that are easy to wear, and quick and fun to sew. 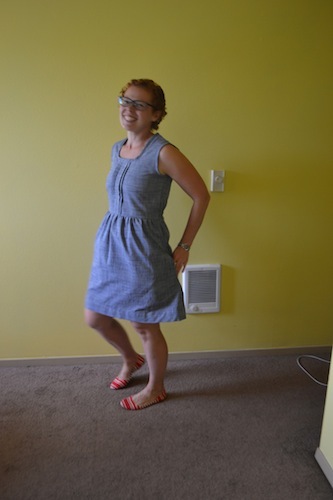 The dress pattern will come with two front panel options, Tuxedo pleats (as seen here) and flat front. And of course with any good everyday dress optional pockets. There is no need to worry about zippers, because I have an elastic band through the back for added comfort and ease of sewing. The Lilly Dress is designed for both new and experienced sewers. For new sewers this is an excellent learning piece and an experienced seamstress can whip this dress out in a couple of hours with no troubles. I am excited to introduce this dress and have it available for sale soon. Producing it has been a labor of love and learning experience from beginning to end. It is also a pattern that is one my favorites (I have made a few!) in my wardrobe and hopefully it will be yours too!